A manometer is used to measure the pressure of liquids or gases. 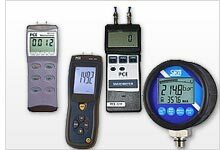 PCE Instruments (PCE) offers handheld digital manometer products as well as flanged manometer and fixed manometer products for use in a variety of practical pressure measuring applications. A handheld digital manometer commonly is used to measure differential pressure in heating, ventilation and air conditioning (HVAC) systems. Differential pressure references the difference in pressure between two points. For example, an HVAC service professional might compare the difference in pressure in front of and behind an air filter when performing duct system diagnostics. A flanged manometer is referred to predominantly as a pressure gauge. This type of pressure measuring tool typically is used to measure relative pressure or absolute pressure. Relative pressure references external air pressure or atmospheric pressure. Absolute pressure references zero pressure or a perfect vacuum. Flanged manometers are threaded pressure gauges designed to connect to pipes containing different liquids or gases. The type of membrane or diaphragm used in the pressure gauge determines the gauge’s compatibility with certain kinds of liquids or gases. For example, ceramic diaphragms are highly resistant to process fluids with abrasive particles, but ceramic diaphragms can be incompatible with strong acids. Whereas stainless steel diaphragms are easy to clean and sterilize, and thus frequently used in the hygienic processing of food and pharmaceutical products. A fixed manometer can be integrated into a control system to regulate a process. Fixed manometers often feature analog outputs that can be configured for analog current (e.g., 4-20 mA) or analog voltage (e.g., 0-10 V) signals. Should you require assistance with selecting the right manometer product for your application, please contact us at or +44 (0) 2380 987 035 for PCE Instruments UK, or at or +1 (561) 320-9162 for PCE Americas Inc. The manometer PCE-HVAC 4 is a versatile measuring instrument for the determination of differential pressure, differential temperature and ambient temperature. The measurements of the manometer PCE-HVAC 4 are via measuring terminals, thermocouples and an internally installed NTC sensor. The manometer PCE-PDA 01L is a reliable differential pressure gauge for pressure measurement of gases in the range of ± 200 Pa. The manometer PCE-PDA 01L has many different pressure measuring functions. The manometer PCE-PDA 10L is a reliable differential pressure gauge for pressure measurement of gases in the range of ±20 kPa. The manometer PCE-PDA 10L has many different pressure measuring functions. The manometer PCE-PDA 100L is a reliable differential pressure gauge for pressure measurement of gases in the range of -100 to +200 kPa. The manometer PCE-PDA 100L has many different pressure measuring functions. The manometer PCE-PDA A100L is suitable for the measurement of atmospheric pressure. This manometer records the pressure from absolute zero to 200 kPa. The manometer can be used for many mobile applications in industry and crafts. The relative pressure manometer PCE-PDA 1000L measures the relative pressure on machines and systems. The relative pressure is measured by this pressure manometer in the range between -100 ... 2000 kPa. The relative pressure manometer PCE-PDA 1000L has a quick coupling connection with which the air pressure or water pressure can be directly applied to the device. PCE-P30 is a digital differential pressure manometer used to measure gauge pressure and true differential pressure in pneumatic, hydraulic, compressor and pump installations, valves, tanks and heating, ventilation and air conditioning (HVAC) systems. 11 pressure units are selectable for Imperial and Metric measurement, including bar, mmHg, ozin², kgcm², psi, inH2, kPa, ftH2O|, inHg, cmH2Oand mbar. 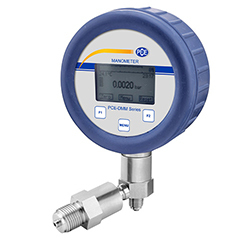 PCE-932 is an easy-to-use, digital, handheld device for high pressure measurement in hydraulic and compressor systems, pumps, tanks and silos in chemical, manufacturing, plastics and HVAC industries. 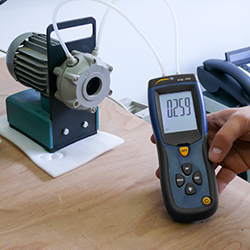 This portable pressure measuring device can be connected to pressure sensors with ranges up to 400 bar (each with a 1.2 m / 3.9 ft connecting cable). Please note: Pressure sensors are sold separately. The manometer PCE-DMM 11 is distinguished by the long battery life of 1800 h. The rotatable housing and display completes the functionality of the manometer. Thus, the manometer PCE-DMM 11 is ideal for mobile applications, such as test beds. The manometer PCE-DMM 51 is suitable for flush mounting hygiene. Thus, the manometer can be installed both in the food industry as well as in medical technology. The manometer shows on its rotatable display pressures up to 400 bar, relative or absolute. The operating fluid of the manometer has a food safe FDA approval.